When it comes to raising teens, education is a large factor. Whether your child struggles or excels academically, there are things you need to know, including how education has changed. 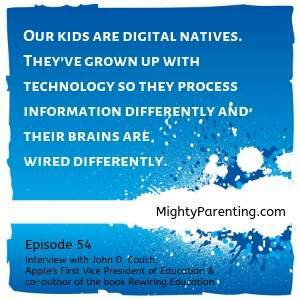 Apple’s first Vice President of Education, John D. Couch, shares his ideas on rewiring education with Mighty Parenting podcast hosts Judy Davis and Sandy Fowler. Apple recruited John to help them use technology to improve the education process and support kids in learning. Find out what works and what doesn’t, how technology can level the playing field, how technology is revolutionizing education as well as how it can unlock every student’s potential. Our kids are digital natives. They’ve grown up with technology. They process information differently and their brains are wired differently. When people try to change education, they either try jettisoning the whole system or they try to patch is. What really works is rewiring it. Technology can help our kids become creators, not just consumers, of information. It promotes collaboration in ways that get our kids interested in creating and learning. Challenged based learning is a highly effective way of getting kids fully involved in learning. It’s hands on and creative. Interestingly, the students who had the most trouble with challenged based learning were honor students. We’ve taken creativity out of the schools. Kindergarten is meant to focus on nature and movement but, in the U.S., we’ve made it about literacy. Technology isn’t just something our kids use; they are digital natives. We can help our kids succeed by helping them find their unique gift then tying it to passion. We are educating a generation of kids who have grown up with technology. They process information differently and their brains are wired differently. We need to go beyond using technology for augmentation and use it for transformation. Parents can help by allowing our kids to be creative and to fail. We need to enable individualized learning. The new ABCs of education are Access, Build, and Code. Technology can be used for good or for bad. We need to use it to create an environment that amplifies intellect. Start seeing the computer as a studio, an ecosystem used to create then to get feedback. Make space for passion and enthusiasm. Nurture curiosity. Facilitate using technology to explore. 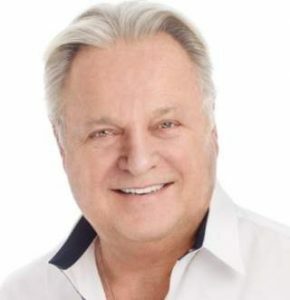 John D Couch holds a Bachelor’s degree in computer science and a Masters degree in electrical engineering and computer science, both from the University of California at Berkeley where he was honored in 2000 as a Distinguished Alumnus. He has also been awarded an Honorary Doctorate of Humane Letters and a Leadership in Innovation Award from Philadelphia University. He is the co-author of the science research associates textbook, Compiler Construction: Theory and Practice. His new book, Rewiring Education, How Technology Can Unlock every Student’s Potential is available on Amazon which proposes a new pedagogy for K-12 education. He has taught courses at both University of California, Berkeley and at Cal State San Jose. Couch began his professional career in 1972 as a software engineer at Hewlett-Packard, and held various software management positions. In 1978 he became Apple’s 54th employee, as Director of New Products reporting to Steve Jobs. He was Apple’s first Vice President of Software and Vice President/General Manager for the Lisa division, Apple’s first GUI Computer. In 1985, he turned his focus to education at the Santa Fe Christian Schools where he turned the debt-laden private school into one of the first examples of how the creative use of technology can revolutionize learning in the classroom. Under his leadership as Chairman of the, the school’s annual losses were annulled as the student body grew from 150 to 1000 while the school’s modest facilities were expanded to a new 17-acre site. Today SFC is a blue ribbon school at the lower, middle and upper schools. Prior to his 2002 return to Apple, Couch was the Chairman and Chief Executive Officer of DoubleTwist Inc, a leading provider of genomic information and bioinformatics analysis technologies that made headlines as the first company to provide a comprehensive annotation of the human genome. The year before joining DoubleTwist, he was Executive in Residence for Mayfield Fund, where he provided strategic planning, management and technology advice to technology companies. At Steve’s request John returned to Apple in 2002, as Apple’s First Vice President of Education responsible for Sales and Marketing growing Apple’s Education business to 9.5 billion over ten years. He was the creator of iTunes U, a platform for the distribution of content and curriculum to more than 150 countries. Today, John presents at numerous national and international conferences on learning. John, under the “Eden Inspirations, as written and produced 28 songs that can be listened to on iTunes and Spotify.